A few months ago, I discovered this company called Charmed Aroma Candles on Facebook. They sell 100% soy candles which contain a ring worth anywhere from $10 up to $5,000. At first, I was really skeptical about idea. How could they possibly afford to give away rings inside their candles? Do their candles cost an arm and a leg in order for them to make a profit or something? I just didn’t understand the concept nor how they could even afford to send out all these rings. After a lot of research, I determined that they must only have a limited quantity of rings costing over $200 since most of the reveals I watched online stated that their rings were on average between $50-$100. Still, some of them looked beautiful. I decided to try one out just to see what all the fuss was about. The candles cost roughly $28 then depending on shipping and handling it could run you up to about $40. Since the company is based out of Toronto, Ontario my shipping would’ve put me at $34. Not horrendous but still rather expensive for a candle. But then considering how much Yankee Candles and Bath and Body Works candles can be, it does seem reasonable. When I went online to their website, it stated that there was a seven week delay! A seven week delay for a candle!? I ended up Facebook messaging the company to see if this was a mistake as there was no way I was going to wait seven weeks for a candle. The owner got back to me about 24 hours later and explained that there had been such a blow up of orders over the summer, they were running low on stock and trying to catch up. They informed me that if the website was now stating there was a seven week wait time, that is likely how long I would have to wait. The company did mention though that I would not be disappointed. Hmmm. Decisions. Decisions. Even though the wait time seemed ridiculous, I informed the company that I run a [relatively small] blog and wanted to do a review on their product in hopes that would perhaps speed up the delivery time. They never did get back to me on that one but it only ended up taking three and a half weeks for my candle to arrive so who knows? I ordered the “Vanilla Crepe” scented one since I do love a good sweet smelling candle. 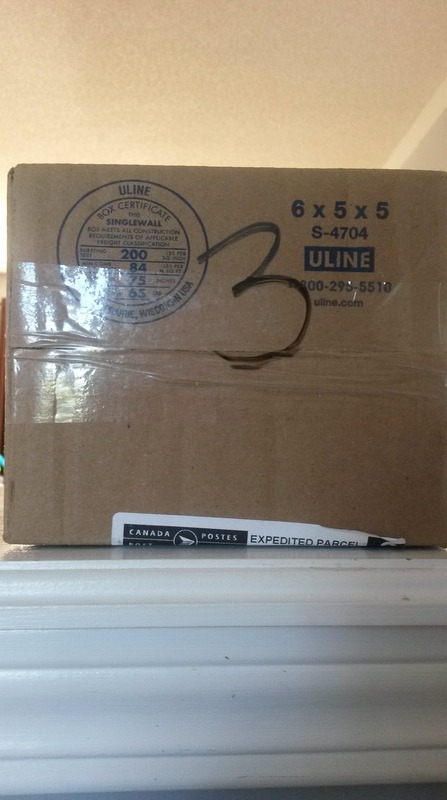 When the package arrived, I was pretty overwhelmed by the scent and started panicking thinking I had made a terrible mistake. It didn’t smell like vanilla at all. It actually smelled closer to a buttery scent! Think buttered popcorn Smackers lip chap. Not pleasant for a candle (in my opinion), however; after opening up the box and taking a whiff of the actual candle, I determined that the strong scent must have just been because it was sealed in the box for so long. The candle itself did have a soft sweet smell to it and was not overpowering by any means. I was quite pleased with how the candle came packaged to me as well. 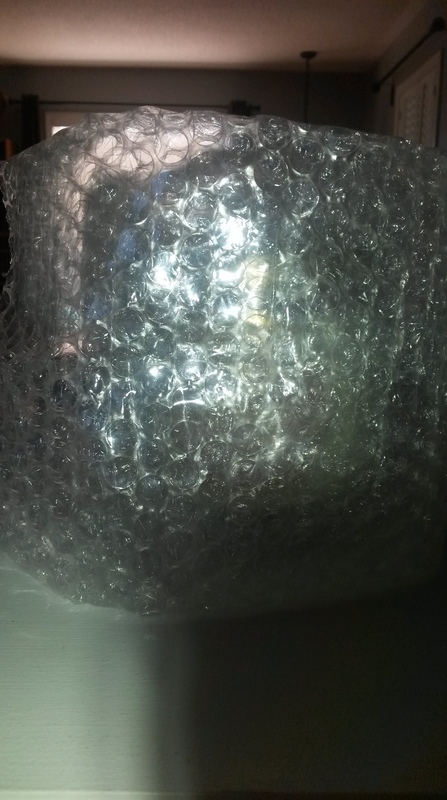 It was sealed in a cardboard box and thoroughly wrapped in bubble wrap. Everything was intact and even if the box had been damaged, I think the candle would have been well protected. It fit perfectly inside my candle holders from Bath and Body Works which made me happy because I often have a hard time finding candles (other than those sold from B&B) that properly fit in these holders. Basically, as soon as I had it set up on the book shelf, I lit it up. Some reveals I have watched stated that people let theirs burn for several hours in one day so they could get their rings. This didn’t seem right to me. I like to enjoy candles and let them burn slowly over a few days or even weeks so I didn’t want it to burn through in one day. Seems pretty pointless especially if you’re spending upwards of $40 for one candle. 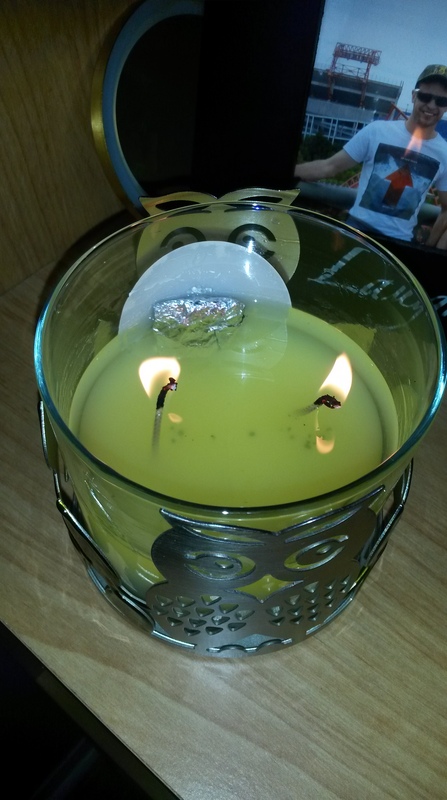 I burned the candle on and off for about 2-3 hours per day for three days before I was able to see the tin foil. Truth be told, I probably could have gotten it out sooner but the foil was placed directly behind the candle’s logo so until I turned the candle around yesterday in the holder, I hadn’t actually been able to see it sticking out. Oh well. Now, I highly suggest you blow the candle out before you go digging around in it! Even the website states to do this! I’ve watched SO many reveals online where people are burning themselves trying to get at this small piece of foil while the candles are still lit. People! You can always relight the candle after you get the foil out and wax won’t dry up that quickly that you can’t get out your ring! C’mon! Think first! So after blowing out the flames, I used tweezers to pull out the foil wrapper then wiped off the excess wax. The ring comes in a small zip lock baggie with a code attached to it. It’s then wrapped in the foil so it does take a little effort to get to the ring because the wax is slippery. 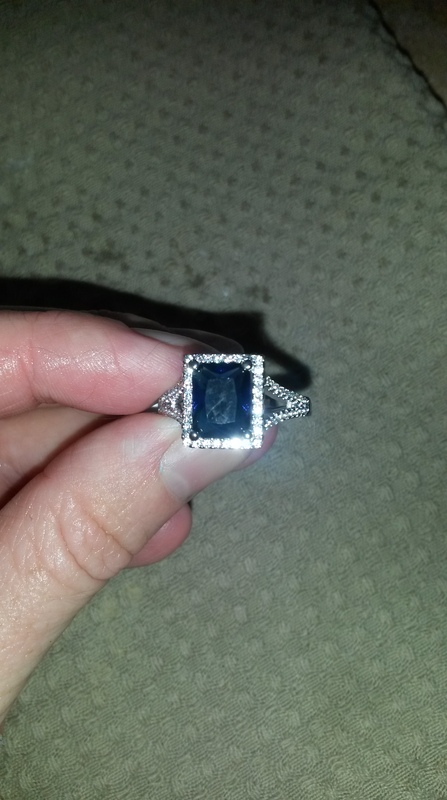 Once I got the ring out I was pleasantly surprised that it was a sapphire since that’s my birthstone. I’ve been wondering if Charmed Aroma adds birthstone rings to the mix of general rings and then sends out a specific amount that they know will be delivered in September because mine was the fourth or fifth sapphire ring I’ve seen on their website and up until September, I’d never seen them send one with this stone before but I have seen people receive other birthstone rings according to which month the candle was delivered in. Luck of the draw I suppose!? 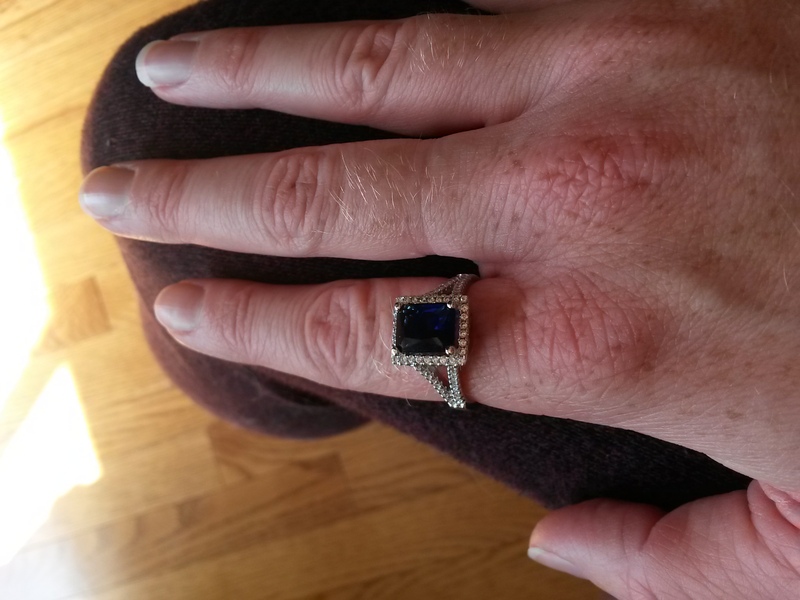 So anyways, back to my ring…after getting it out of the plastic wrap, I took the code and went online. 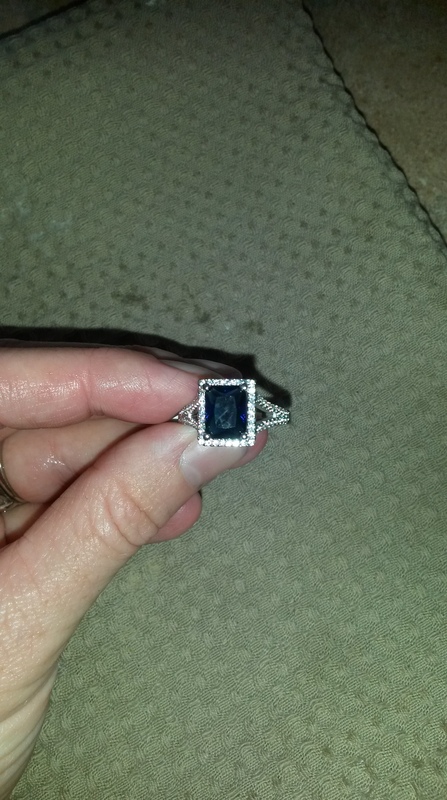 My ring appraised at $60, which in my opinion, does seem pretty high for how it looks but then again, I have seen some pretty expensive costume jewelry out there so maybe it is right after all? Now, I do have two issues with these rings. First is that they only come in sizes 6-8 and it’s basically you get what you get kinda thing. Obviously, I could go and get the ring sized but really do I want to size costume jewelry? It’ll end up costing me more money than the ring is probably worth. I would say that the ring I received is about a 7 and my ring size is a 5.5. 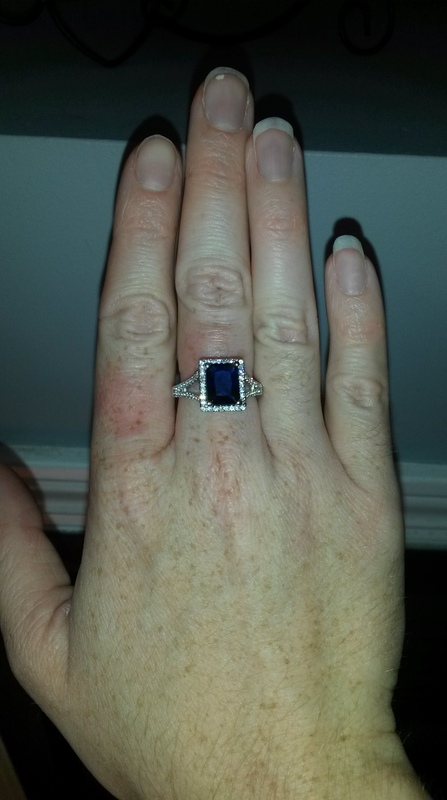 It fits on both my index fingers but that’s a little uncomfortable given the actual size of the ring. I wish you there was a way you could tell the company the size of your fingers and they would send you a candle with a ring inside according to what you have stated. It might be a little extra work for them but in the long run I think it would pay off! My second issue isn’t to do with the company. It’s to do with the greedy people online complaining because all the rings are “fake”. Listen, you’re buying a candle that comes with a FREE ring. If you want a crazy expensive ring then I suggest you go out to People’s or Ben Moss and buy yourself one because chances are the ring you receive isn’t going to be worth a boat load of money. From the reveals I’ve watched, I’ve seen maybe 10 or 11 that state their rings are worth more than $200. The company itself has even said for the really expensive rings, you will only receive a code. You then contact them and they’ll ship you your ring so obviously if you receive a ring in your candle, it’s not the $5,000 one. To be honest, I’ve never watched a reveal that shows the person only receiving a code so I think it’s VERY rare to get an expensive ring but like I said, you’re buying a candle not a ring so get over it. All and all, I really enjoyed the candle. 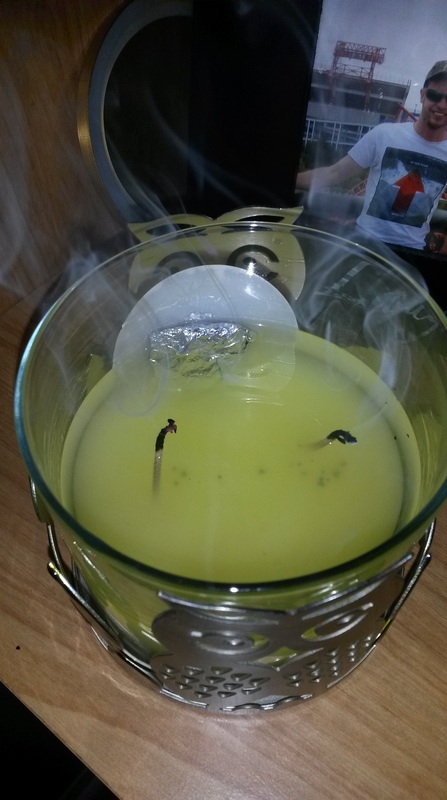 It’s only about 1/3 burned down too which is nice because now I can occasionally light it and really enjoy the scent. One thing I would like to see is some holiday scents from Charmed Aroma. I noticed that they only have four candles to choose from. Vanilla Crepe, Sweet Pea, Velvet Peach, and Emerald Lime. I think adding in Fall scents as well as Christmas/Holiday season scents would help boost sales. But then again, considering I was told there was a seven week wait time, it looks like they’re doing all right as it is! I’m really looking forward to trying this concept again but perhaps next time I’ll try “Jewelry In Candles“. It’s the same idea, only you choose the jewelry you want (ie ring, bracelet, necklace, earrings) as well as the size of your fingers (if choosing the ring item) then it appears they send you what they have in stock according to what you’ve chosen; which is really what I think Charmed Aroma should look into. I should also mention that I have read many reviews that state the rings have turned the wearers finger green which can happen with any form of metal but it is something to keep in mind in case your skin is very sensitive. I also wouldn’t recommend washing your hands or showering with it on but then you really shouldn’t do that with expensive jewelry either! Another quick note is that the company loves for you to send in pictures and videos of your reveals! You can go to their website, Facebook page, or instagram to tag them! I LOVE charmed aroma! I’ve tried other candle jewellery sites but nothing beats them. I first bought all scents for myself (even apple cinnamon when it is in stock!) and loved them all so I’ve been buying them for an incentive (inSCENTive I should say) gift at work! It’s a hit! I regularly make $3000 orders haha, they love me at charmed aroma! That’s a great tip! Thanks so much for sharing! I just had to mention that since you are disappointed in the size of rings that come with charmed aroma that you need to try out Jewelry in candles. You choose from nnecklaces, earrings, men rings and women’s rings. You choose your ring size and from over 90+ scents! email me for more information! Keep in mind though if you check out my website that it is in USD. Thanks for sharing! I had a friend who got a $300 ring in hers, but I guess it’s obviously down to luck! The Size 6-8 definitely wouldn’t fit my hand, so you bring up some great points! I tried scentedsecret.com because of the ring size issue with Charmed Aroma. They’re new and honestly it took a couple weeks before I got my candle but it smelled great and I got beautiful ring that fits! They’re offering a $10,000 ring from Tiffany’s too 🙂 I’m hooked! I love Charmed Aroma got my ring today I got it appraised and it says it’s $600. I guess it’s whatever luck you get on the candle you buy. love the smell this makes a great Mother’s Day gift birthday xcetera…. I am still waiting on replacement candle. I had ordered a candle in late December and got the same 7 week delay message. That was fine. February 2nd, I get he message with a tracking code for my candle, it was actually going to show on my Birthday (Feb 4th). The candle never showed. Both Charmed aroma and Canada Post did investigating and on February 21st, charmed said they would replace my candle. The delivery was going to be 2-4 weeks. I have yet to receive my candle… I am very disappointed in this. I can’t really wear the rings, but I like the candle and love how this is a Canadian company and Canadian made product thus why I ordered from them. The rings in these candles are not worth close to what it says they are these are rings that can be purchased on ebay or from china for a couple of dollars. Its sad cause some people believe this and then go to the jewelry store to get it sized or what ever only to be told its worth $2 and they are left feeling embarrassed, my daughter got one she doesn’t make a lot of money but decided to treat herself because of all the hype on how much the rings are worth when she got it she was told it was worth $60, i have been buying and selling jewelry and jewelry making supplies for 14 years and i knew right then and there it was worth only a couple of dollars she didn’t believe me so she took it to a jewelry store to have it appraised and was told the same thing. I have no problem with putting cheap rings in a candle i think its a fun idea but they need to stop putting fake appraisals in them why do they even need to be in there besides the fact that’s what you use to rope people into buying them. Shame on you. I’m sorry are you saying shame on me towards myself or Charmed Aroma? Because this review was based on opinions that were SOLELY my own. I am in no way compensated by Charmed Aroma for what I reviewed on my blog post. I sincerely hope that when you said “shame on you” you were referring to the company itself and not me. 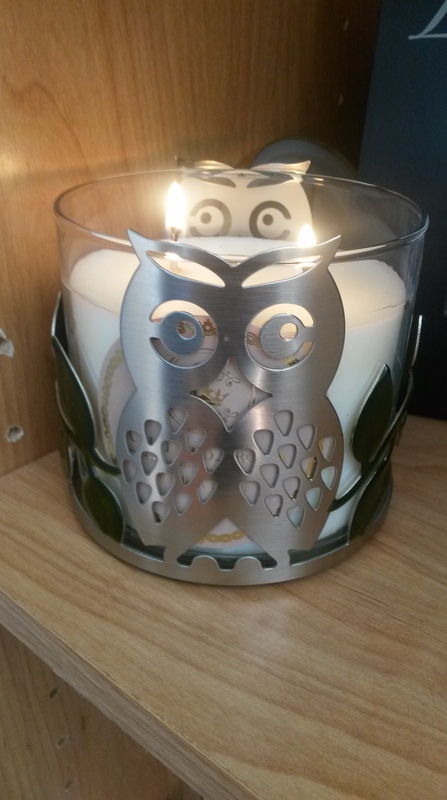 I quite enjoyed my candle that I bought for myself and decided to do a product review on. While I fully admit the rings are no where close to the estimated value, I don’t really think that should be the point. I loved the candle and its smell and I would gladly buy another (out of my own money) just for the fact. I do hope you realize that I did not receive any payment for my review and that I did specifically state as such in this blog post. I’m sorry your daughter had a poor experience with this candle and company but it’s not fair to accuse me of anything that I have no control over. I do not work for Charmed Aroma. No i was actually directing it towards the company not you, everyone is entitled to their own opinion good or bad, i apologize for the misunderstanding but i had no problem with your blog post. Their Facebook page has many reveal videos and photos – one of which a girl received a code for a higher ticketed piece of jewelry!! I’m disappointed that the ring turns my finger green, sterling silver rings are fairly cheap and they don’t turn your finger green. Love the smell of the candle and the look of the ring but very disappointed in the quality of the ring. Hello there, I was simply googling “how does charmed aroma afford to put jewelry in their candles” and came up with your blog, so I read the in tire thing. Thank you so much! That is so nice of you to say in regards to my writing! I really appreciated it. Have a wonderful day!! Your welcome! Too many people just like to be negative and say negative things, instead of looking at the positives in life. Life is too short! Be happy people! Laugh, learn and spread joy! Im glad I read your blog! I ordered mine a few days ago because I see the company posting so much about it on my Facebook . I never actually googled other people opinions before, I really hope the ring doesn’t turn my finger green , I also hope I enjoy the scent of mine! I bought the strawberry champagne one. I was expecting more to be honest about the candles, but your right if a candle is $35 I’m probably not going to receive a ring more than $100. I enjoyed reading this! Thanks for reading! Honestly, I think these candles are a great idea! It’s like a little surprise inside a terrific smelling candle. I’ve just discovered that they’re now making bath bombs!! I’m so excited to try one of those out too. Thanks for your lovely comment! That’s great to hear! I’m glad your daughter enjoyed it! That’s the important part right? Not getting the ring worth $5,000. I have yet to try their bath bombs but I’ve heard so many people saying how awesome they are that I just might have to order one for myself! Thank you for taking the time to read and reply! I hear you can’t choose your ring size. Plus my ring size is a half size (6.5) which I doubt they do. Hi Carlyrose 28…enjoyed your review :). I was skeptical like a lot of others for about a year before I first ordered. After watching and reading and looking at lots of great videos and pintrest photos and customer reveal comments, I ordered. They had a “pink sugar cookie” scented limited edition candle promotion at the time with some of the proceeds going to breast cancer. I ordered 2. the scent threw very well and was not overpowering. Nice box, nice container and the rings were gorgeous. I ordered 2 champagne and strawberry candles as well. Beautiful cranberry color glass with silver lining in both the container and lid with small holes in places in the silver on purpose that look like Champagne bubbles. This type is 3 wick. The scent threw well but I found it a bit overwhelming but smelled as described. They were larger that I imagined which was nice. All the containers are nice and can be reused / repurposed. The rings in those gorgeous as well. This type also comes in Apple Cinnamon in a clear silver lined jar. I also ordered 2 Peach and Mango bath bombs. They are huge and smell great and the rings again were gorgeous. They have 3 types / scents of bombs. All bath bombs guarantee a sterling ring as well as some of the higher end candles like I purchased. To always order a sterling ring just makes more sense if you can. They do offer what they call size a ring candles and carry I think sizes 5-10 or 11…so you do have many choices. They also have necklace candles. They package very well and delivery I feel is good even within high demand times. They are pretty popular a therefore in high demand so delays are to be understandable. I was also happy to be able to use visa debit. I found their order site easy to use, and the give acknowledgement emails and email when order is being shipped out. Expecting a delivery in a day or two for gifts. Subscribing to their newsletter gives heads up on great deals and so does their FB page. Same as yourself, I will receive nothing for this endorsement…I just love their product. when I am pleased with a product…I like to share that info. Happy Holidays. Thanks so much for all the info!! I love reading other people’s experiences with these products (especially the positive ones!). I’ve definitely got to order some more some time soon! Thanks for reading Elaine! I ordered a candle as a gift for Christmas. Also, in the box, was a small pink plastic bubble, which had a ring inside. I put the code into the website but all it says is the ring is .925 sterling silver and to send a picture of the ring to their email address. Anyone else have this happen? I now wonder if there is a ring in the candle as well. i completely understand the excitement of the potential of getting a pricey piece of jewelry and the associated mystery. It’s like playing lotto scratch cards, so I do get it. That said, I hope people are being logical when they buy these candles. I hate to hear about people who are disappointed because they believe they are getting more than they actually are. First, these candles are cheaper candles. They are not 100% soy. They are a soy blend, and made up largely of paraffin. Hey are laden with chemical that when burned become carcinogenic. However, if knowing this, and it does not bother you (it doesn’t bother everyone), then no worries. I personally would never buy bath and body works candles or other candles like this as they have so many chemicals. However, that is just how I feel. No judgment on others who are okay with this (again as long as they know about it). Second, the question of how do they afford to put the ring in? Simply put, the rings are not worth more than a few dollars each. Yes even the $100 rings. Their “appraised value” is likely a potential retail value, and even that is incredibly inflated. It also wouldn’t surprise me if they own the “independent jewelry appraisal company”, which I almost guarantee they do. If you pay to have the rings appraised, the appraisal would cost more than any of the rings. That said, I believe the high priced $4000 ring may appraise closer to their claimed value as it is the draw for everyone to buy these overpriced candles. I mean just using logic, if you could sell a ring for $50 then why put it in a $25 candle? There are too many $50 rings for this schematic to make sense, financially. So basically, the $50 rings are actually worth $2. Maybe you could buy it Retail for $10 but it’s only worth pennies. Again, if you know the ring you are getting is only worth a few dollars, and is bubblegum jewelry, And you are aware you are paying a premium price for a low quality candle (you can get a lovey artistically 100% REAL soy candle with natural Fragrance for $30), And you still love the idea, then awesome! However, you are buying the excitement and the mystery and the enjoyment, NOT a quality ring or candle. You are actually paying a PREMIUM for a candle and ring you could pay less for separately (this would be true for 80% or more of the candles; for a few candles, you really would get more than you paid for-again, like the scratch tickets). I ordered 4 candles for myself. Love the sent. First one said ring is worth $200. Was so excited could not wait to get other rings. Then the second and third one says they are appraised at $250 and $150 and forth one 925 sterling silver and send in a picture. The excitement left knowing there is no way all my rings are worth that much. But I love the scent of the candles and that is the important part. Will continue to order. Fantastic blog. I would love for you to do one for Ice N Fire. Its hand made in BC canada. Same day shipping and choose your own ring size!! Hi Tamara, thanks so much for reading and commenting! I would love to review this brand. Would you mind sending me a email that includes a little bit about the company and we can firm up details? Thanks!